The tuner is kept in-line all the time. TUNER/DUMMY LOAD This is the function selector switch. 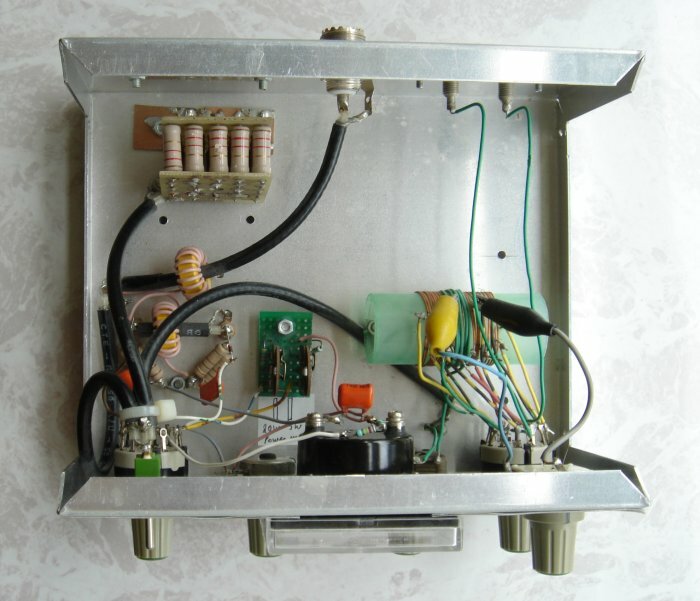 METER 5W: Measure power. Maximum meter deflection is 5 W.
20W: Measure power. Maximum meter deflection is 20 W.
is in the FORW position. The different blocks are seen in fig. 2 (left picture). Please compare with the photo in fig. 3. The Stockton power meter was originally described by G4ZNQ David Stockton in SPRAT (the journal of G QRP Club). The power meter is simple to build and has low insertion loss and good accuracy. Fig. 4. Stockton Power Meter. The power meter is built around two transformers: T1 and T2. 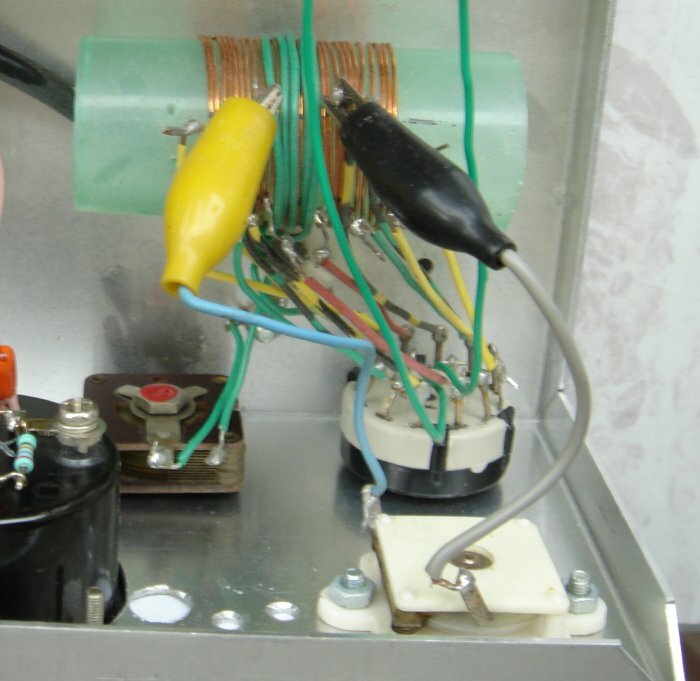 Each transformer has one winding on the primary side and 12 windings on the secondary side. The single wire (on the primary side) is a piece of RG-58 coax cable (50 ohm impedance). 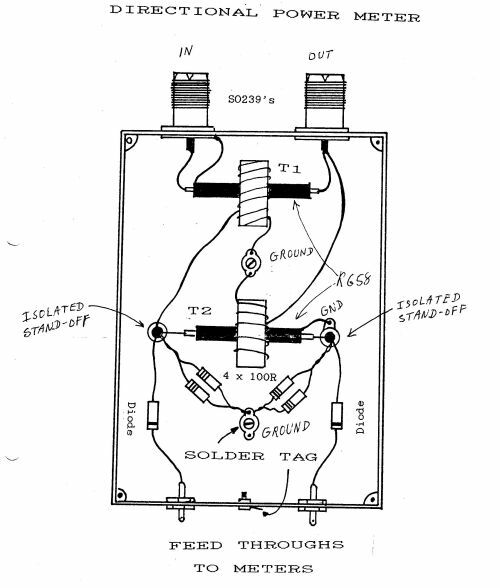 The secondary side is 12 turns of isolated wire (about 22 AWG) wound on a toroid core (Amidon T-68-6). The sketch below was enclosed with the kit from Kanga Products. It shows how T1 and T2 are mounted. Mounting of T1 and T2. Click the picture to enlarge. Set S1 to DUMMYLOAD. Set the METER switch in pos. 1 and apply exactly 5 W at 28 MHz (or lower) to the input terminal. The applied power is measured with another power meter. Adjust the 10 kohm trimmer to set the needle at the 5 W mark. The remaining scale is marked with a thin pen. I have set marks at 4 W, 3 W, 2 W, 1 W, 0.5 W and 0.2 W. This calibration requires that the output of your power source can be reduced! Set S1 to DUMMYLOAD. Set the METER switch in pos. 2 and apply exactly 20 W at 28 MHz (or lower) to the input terminal. The applied power is measured with another power meter. Adjust the 22 kohm trimmer to set the needle at the 20 W mark. The remaining scale is marked with a thin pen. I have set marks at 15 W, 10 W, 5 W, 2 W and 1W. This calibration requires that the output of your power source can be reduced! Set S1 to DUMMYLOAD. Set the S2 METER switch in pos. 3 and apply a few watts of power to the input terminal. Adjust FORW SET to full meter deflection. Move the S2 METER switch to pos. 4 and read the meter. The deflection in pos. 4 should be zero (or close to zero) because the SWR is 1:1 (Input impedance is 50 ohm and the dummyload is 50 ohm). This is marked as "1" on the meter scale. Now replace the 50 ohm dummyload with a 100 ohm resistor and repeat the procedure. This is the "2" mark. 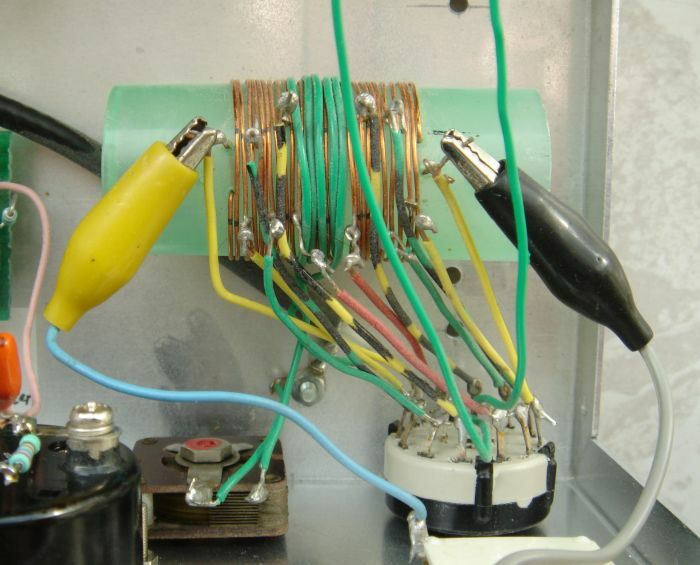 Insert a 150 ohm resistor, repeat the procedure, and mark the "3" deflection on the meter scale. Finally, reconnect the 50 ohm dummyload. Set S1 to TUNER. Set the S2 METER switch in pos. 3 and apply a few watts of power to the input terminal. Adjust FORW SET to full meter deflection. Move the S2 METER switch to pos. 4 and read the meter. The deflection in pos. 4 shows the SWR. Leaving S1 in position 4 is useful when the antenna tuner is being adjusted. You can monitor how each twist of a knob affects the SWR. The tuner's input circuit is unbalanced and it consists of Cin and Lin. 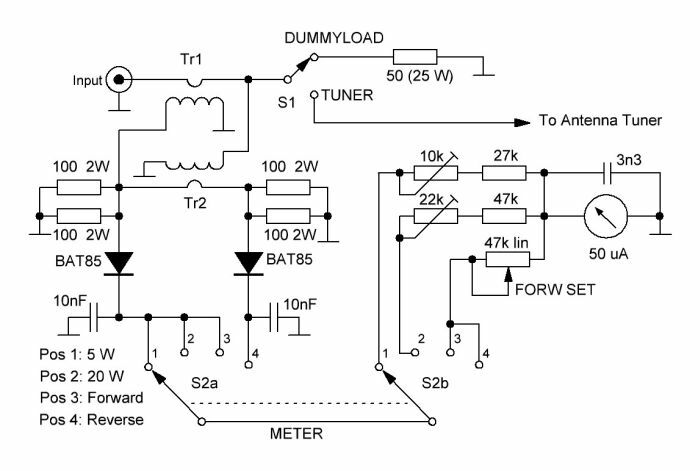 The balanced output circuit consists of Lout and Cout. 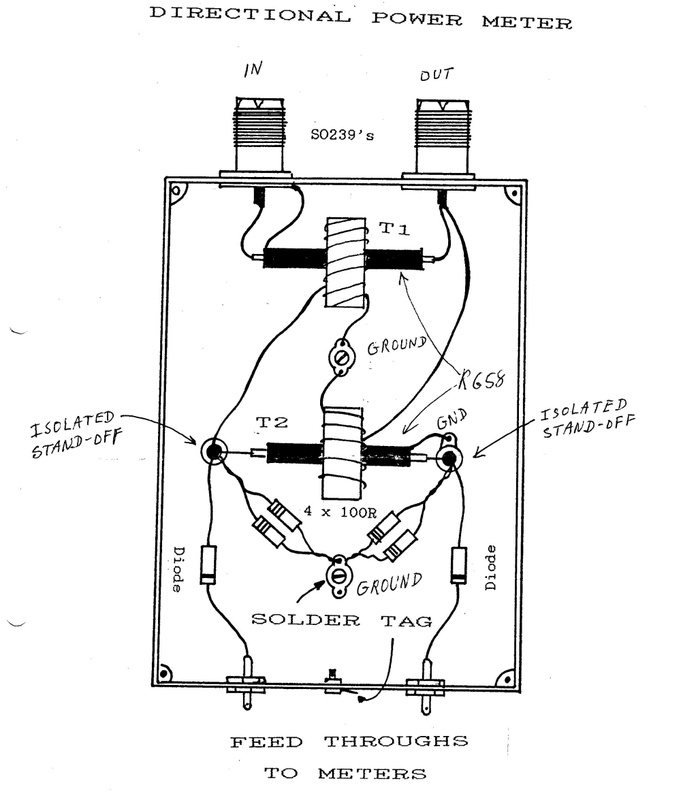 Lout is an inductor with 2 x 6 taps. The balanced output terminals can be connected to any pair of taps (symmetrically) using the rotary switch S1. As an additional feature, Cout can be connected to any pair of taps by alligator clips. 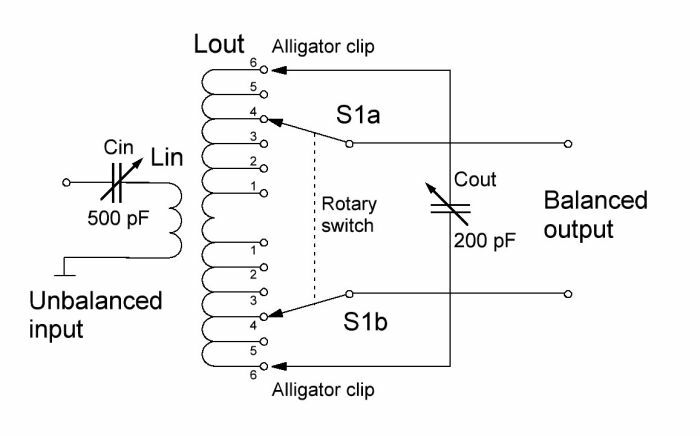 This makes tuning at high frequencies easy because the Lout inductance is less if Cout is connected to one of the inner taps, e.g. the #3 taps. Cout should always be connected symmetrically to the Lout taps. Lout is not grounded. Fig. 5. 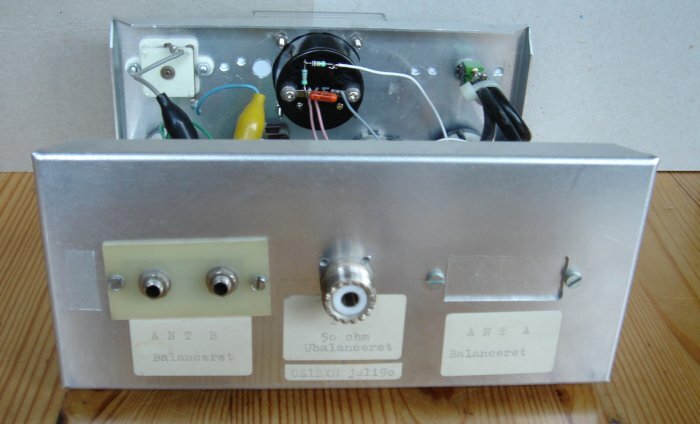 Balanced Antenna Tuner. Lout 26 turns 0.6 mm (22 AWG). Length of winding is 28 mm (about 1 inch). Make 6 taps every 2 turns beginning from one side; then make 6 more taps beginning from the other side. Coil form Diameter is 26 mm (1 inch); length is 60 mm (2½ inch). The coil form is a plastic container used for coins. I asked for one in a local bank and got it for free. Here are more pictures showing the construction of L and its taps. Figure 6. Cout is connected to the two taps #6 (used at low frequencies). Figure 7. Cout is connected to the two taps #2 (used at high frequencies). Latest revision November 16th, 2015 by Lars Petersen, OZ1BXM.